I got drunk a couple of years ago and signed up to MobileMe. It was a sixty day free trial so I figured there was little to lose. Two months later, I got drunk again and forgot to cancel the subscription. Steve Jobs duly buried his hand into my trouser pocket and took £59. I couldn’t complain or ask for it back because I’d agreed to let him do so sixty days prior. I’d simply forgotten to cancel the trial and had chosen the expiry date to go out for a few beers. iWhoops. He did the same thing a year later, although that time I was sober and had just resigned myself to the fact that he’d come along and relieve me of my hard earned every twelve months. Disclaimer: as much as I love Apple products, that is not a euphemism. Then, a further year on, he didn’t bother. Instead, he took to a stage so large it could house three symphony orchestras to proclaim, quite simply, that MobileMe was in fact, utterly, totally, irreversibly shite. And that was it. No ‘sorry’, or ‘here, have your £118 back’. Just a rare admission from the man who continues to reinvent everything (only to later add the important bits that were missing at the start via a series of updates) that one of their reinventions was ‘not our finest hour’. I agree. It wasn’t even their finest fifteen minutes. MobileMe was, in principle, a good idea, if not a new one. It was expensive, though, and I am forever asking myself what I’m getting for £59. I have email, calendars and contacts synced between my various devices. I also have a 20GB iDisk which I occasionally put 40KB PDF files on. I used to have all that elsewhere and for free. Still, MobileMe had cool graphics and the James Bond-like Find My iPhone which even featured a radar for the icon (that’s cool, right? Radars are definitely cool). Obviously, it wouldn’t find your iPhone – it would simply highlight a 20 mile radius in which it might be located. That’s not very useful. I could probably do the same thing myself just by thinking about it. But Find My iPhone had a green radar thing that swung around and beeped. So that made it all fine. Anyway, I digress. Now we have iCloud which is free and a more rounded solution. But, as cool as it looks, that’s not what I want to talk about. There was one word which seemed to permeate through the entire keynote address. It wasn’t preceded by an ‘i’, nor was it followed by the interminably irritating ‘it’s just beauuuutiful’ – a phrase Apple has even used to describe an email client’s reading pane. The word was ‘PC’. Steve Jobs will occasionally point and laugh at this silly little acronym. In the past, he’s received a muffled guffaw from his adoring crowd as he highlights just how rubbish PCs are. How they have missed the point of personal computing entirely and continue to make each of our lives a living hell through their wrong approach to multi-tasking, wrong approach to security, poor hardware and for sleeping with our partners behind our backs. Obviously, this is nonsense. PCs do work. They might not have the same pretty animations that Mac OS X has mastered so beauuuutifully, but they do a job and will continue to for the vast majority of home and business users on the planet Only, now, we’re being told that we can cut ourselves free of the PC. Snip through the digital umbilical cord, if you like. Apple even had a little icon for this. 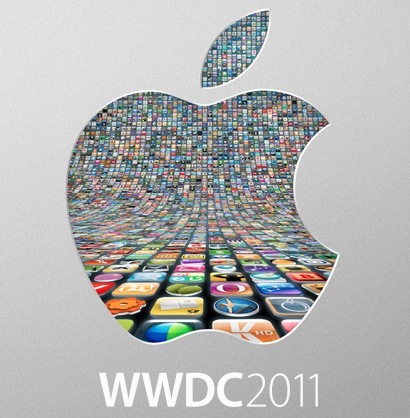 Principally, they are referring to iOS 5 which includes the ability to wirelessly sync with iTunes and setup iOS devices without connecting them to a computer. Of course, by ‘PC’ and the newly coined phrase ‘Post PC’, they are also referring to Macs (we’re not stupid, Steve) and it was encouraging to hear them ‘demote’ all devices – iPads, iPhones, laptops, desktops – to just that: devices. Bits of metal which can be setup independently and display all of the stuff we store on the cloud. Viewing panes into our remote, digital world. Nothing more. I like that. I predict that, eventually, this will make complex operating systems a thing of the past. As Jobs noted, file systems are cumbersome and difficult for novices to get their heads around, yet they are the one thing we rely on almost every day. Why not let applications and web servers do the work? This premise is put to fantastic use in iOS. I also predict, as I have noted to people in the past, that OS X will continue to turn into iOS. It’s happening already with Lion; full screen apps and Launchpad (iOS-esque app organisation) were present at yesterday’s demo. Those that need more functionality (and by that, I mean principally developers and bedroom tweakers [no laughing at the back]) will continue to have the tools they need to do their jobs via SDKs. But us, the everyday user? Cutting the link between ourselves, our devices and our desktop machines is just the start. I think the people at Apple gave us quite a significant glance into the future yesterday. I think before anyone can be successful in transitioning the seething masses to The Cloud, people have to know wtf it is, and we’re still a bit hazy on that (no pun intended). The fact of the matter is, we’ve probably already moved — mostly — to the cloud, we just didn’t know it was called that. We don’t start up Facebook.app whenever we want to see what grandma is cooking for dinner or who got what on their farm. And yet defining, and even more than that, monetizing web applications (aka The Cloud) is a difficult prospect for anyone to master given that we all expect that, once we’re plugged into teh internets, everything is free. So, what we’re really saying is that no one has quite managed it yet…? I’m not suggesting iCloud will be successful, but I can’t see Apple falling over just yet, they’re on quite a stride. I do completely agree with everything you say, though, and there is indeed a certain amount of injustice in all of this. That may be, but, after watching the highlights of the WWDC, listening to Steve Jobs talk about the cloud sounds about as hip as listening to my grandfather talking about his coin collection. I can’t help but think that this has all been done before by not just Google but even (in their own, sort of clunky way) Microsoft, and that they’re going to have a lot of catching up to do to take over from the big G-word (not that that has ever stopped them before, really). Couldn’t agree more, Chris. Apple have one advantage, which you highlighted – image. Unfortunately, image sells and inspires people and a multi-billion dollar company like Apple – who have mastered the art of branding, in my opinion – will regularly triumph with ideas which they are neither pioneering, nor mastering. Look at the press. I’m not sure what it’s been like in the US this week, but the word ‘iCloud’ has been plastered across the UK media, purely because Apple have delved into cloud-based computing. It’s for that reason, and because of the way in which Apple present themselves that your gran will know what an iCloud is, yet she won’t have a Jimmy Choo what Google Docs is. Unfortunately (or fortunately, depending on which side of the spectrum you’re on, I suppose), we already got this glimpse into the future over a year ago when Google was demoing their ChromeOS and devices. As is Apple’s standard mode of operation, they hop into the game late, set up shop, and will proceed — inevitably — to dominate the market to the extent that people wonder if there are any competitors out there (Blackberry who?). I have no doubt that with Apple coming to the plate (ooh, sorry, that’s an American-ism, isn’t it?) this pattern will only continue, however, as our devices are turning increasingly into terminals by which we access the internet, web services, email and chat, platform won’t matter. Apple’s only advantage is their marketing, their design, and their snobbishness which makes Apple acolytes feel smugly superior to the infidels (who may actually know more about what a computer does and how it works than the average Apple-user with it’s hermetically sealed interface that “just works”). It’s dangerous ground, especially when their main competitor is no longer Microsoft (an easy target) but Google, who knows more about the cloud and web applications than anyone and who is the only company that’s successfully given Apple a run for their money with AndroidOS (before Android, was there really any competition for the iPhone? Really? ).